The exact origins of the allegations are unclear. However, one thesis that eventually found its way to the forum's FB extension was penned by an individual who claimed to be a former tourism secretary under the Cory administration: Manny SD Lopez. His thesis appears below. To understand the allegations that the PAF faces . . . one must also become familiar with the assertions of individuals who share Lopez's views. This thread if focused on point-to-point rebuttals of these assertions. It has been placed in the "First Posts" forum so that all members are able to participate in discussions. For broad-strokes understanding of the complexity of military procurement in general, see here: Are the FA-50s overpriced?, which is a reference thread that will facilitate "static-free" sharing of information about the nature of equipment acquisitions. WHERE ARE THE FA-50 MULTIROLE FIGHTER JETS OF THE PHILIPPINE AIR FORCE? 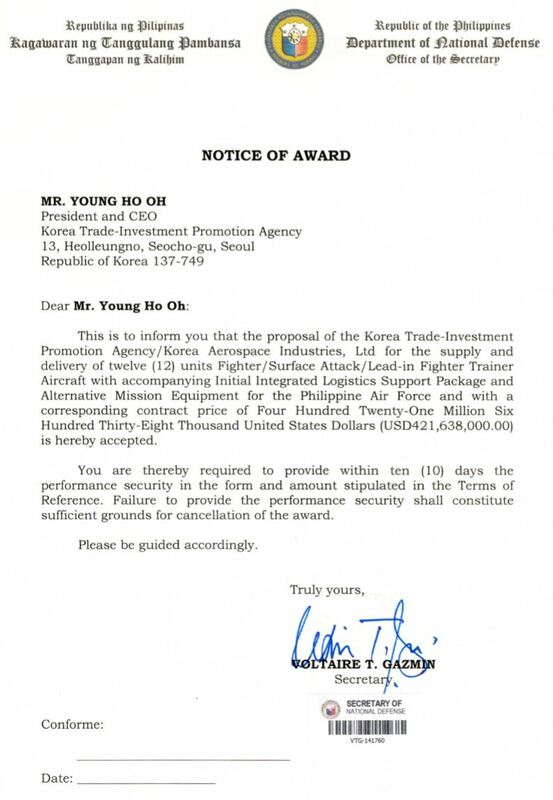 The Benigno C. Aquino III administration as recommended by then Defense Secretary Voltaire Gazmin and approved by Executive Secretary Paquito Ochoa acquired 12 units of Korean Aerospace Industries ( KAI ) FA-50 jet aircrafts costing US$ 464-Million as among the major acquisitions of the P 170-Billion AFP Modernization Program. Many millions more were spent for munitions including missiles and bombs to hit air and land targets. The overpriced, unproven and limited production jet aircrafts were advertised as Multirole Fighters ( MRF ) for air defense, ground attack and reconnaissance using air-to-air, air-to-ground missiles and precision guided bombs. The original T-50 aircraft was designed as an advanced jet trainer following the LIFT concept. The KAI FA-50 light fighter aircraft was advertised as capable of attacking ground targets with Maverick air-to-ground missile, JDAM and other precision bombs, guided by Israeli-made Elta EL/M-2032 radar fire control system. The features, performance envelope and combat capabilities were cited to justify the high price tag of about US$ 38.66-Million per unit as contracted by the Department of National Defense for the Philippine Air Force. However, my research indicate an overprice of around US$ 8.66-Million per unit, when compared to the acquisition price of the same KAI FA-50 model acquired by the Republic of South Korea Air Force at US$ 30-Million per unit, with the Indonesian Air Force acquisition of the KAI TA-50 model optimized for attack role at US$ 25-Million per unit with provision for technology transfer. After PRRD criticized the Korean-made aircrafts as useless and good only for fly-bys, sources from the PAF leaked serious technical issues of incompatibility/integration between the FA-50's radar fire control system with the U.S. Sidewinder air-to-air missiles, and perhaps with the Maverick ground attack missiles, JDAM and precision guided bombs it was suppose to carry for the required combat missions. After 10 days of intense fighting in Marawi, the PAF could have deployed these MRFs for precision ground attack role. So far we have witnessed only helicopters and propeller-driven SF260, OV-10 Bronco light attack aircrafts doing ground attack, using unguided 70mm air-to-ground rockets, machine gun pods for strafing and conventionally dropped bombs. No precision ground attacks vs. the Maute-ASG-ISIS terrorists using radar guided AGMs and JDAMs by the KAI FA-50 light combat aircraft fleet costing US$ 464-Million ! Perhaps this is the reason why DND Sec. Delfin Lorenzana went public to reveal the shortcomings faced by our soldiers fighting on the ground and pilots providing air support. A pro-KAI FA-50 lobby group will surely crank up into action to defend / rationalize the flawed acquisition of these overpriced, unproven limited production jet trainers passed off as high performance multirole fighters. The past DND-AFP-PAF leadership binded the national government in a lopsided contract costing the Filipino taxpayers US$ 464-Million for the over rated combat aircrafts. Worst, these past officials compromised the national security of the Republic of the Philippines and the Filipino people. They are endangering the lives of our soldiers and airmen, but more so the safety of the citizenry they are duty bound to defend. The amount involved makes the pork barrel fund anomalies look like petty cash. Is a public inquiry necessary in this regard? 1. Limited production aircraft with unproven history of performance, reliability, supportability and overall sustainability. 2. Very high cost as a jet trainer, almost or even more expensive than the MRFs the PAF could actually afford. The LIFT training concept is geared for pilots transitioning to 5 gen MRFs such as F35s. 3. On the other hand, the Korean-assembled FA-50 jet trainers may be classified as a light fighter at most, given the size, performance envelope and upgrades. It cannot pass as a true MRF capable of defending Philippine airspace and realistically engage its potential adversaries. In the WPS, the PLA AF will likely deploy SU-27/30s, J15s or better with +100 km. Beyond Visual Range ( BVR ) air-to-air combat capability. Over North Borneo, Malaysia can deploy its own version of Sukhoi SU30s, US-made F18 Hornets and MIG-29s with far superior air combat capabilities to the small less capable and high priced FA50s. Over the Batanes, the Taiwanese AF sent its fleet of Mirage 2000 MRFs and RP had to buckle down for enforcing its fishery laws and prosecute its own Coast Guards for doing their job. 4. Todate, despite spending a huge amount to the tune of around P 18.9-Billion as budgeted, announced and published by the DND for the acquisition of 12 units of KAI FA-50 jet trainers. The unproven, high priced aircrafts was described by no less than President Rodrigo Roa Duterte as good only for ceremonial fly-bys. There are serious legal and technical impediments that is preventing the integration of Israeli-made EL-2032 fire control radar and other systems with the US-made weapon systems including the AIM9 Sidewinder AAM, Maverick AGM and precision guided JDAMs. The limited engagement and minimal use of the FA-50 to deliver precision guided munitions in the Marawi siege is proof of these foreseable impediments. As a concerned citizen with some background in aerospace technology, I have dutifully warned the DND-AFP back in 2013 on " why the PAF should not acquire FA-50 jets " and even suggested better and more cost effective alternatives at the time. In fairness to all the members of the PAF, there was a muted opposition to the acquisition of the Korean made jet trainers in lieu of true MRFs and more appropriate basic jet trainers. As a military organization, they are expected to follow orders and the chain of command... And unfortunately do with these unproven, lightweight and high-priced aircrafts. The new leadership and body politic will now have to address the issue accordingly. Lopez can actually start to reconcile his alleged overprice by getting his figures right. The Benigno C. Aquino III administration as recommended by then Defense Secretary Voltaire Gazmin and approved by Executive Secretary Paquito Ochoa acquired 12 units of Korean Aerospace Industries ( KAI ) FA-50 jet aircrafts costing US$ 464-Million as among the major acquisitions of the P 170-Billion AFP Modernization Program. The official DND value was actually US$421,638,000.00. A copy of the DND's Notice of Award to KAI appears below. It's worth noting that later in his thesis, Lopez assumed that the per-aircraft value of the FA-50 is based on his inflated figure above . . . merely divided by the number of aircraft. Completely ignoring the cost of spares and training of PAF pilots that were included in the Integrated Logistics Package of the FA-50 that is mandated by DND regulations. Many millions more were spent for munitions including missiles and bombs to hit air and land targets. Ammunition and ordnance were not actually included in the FA-50 purchase. Weapons were to be purchased separately. See here. The overpriced, unproven and limited production jet aircrafts were advertised as Multirole Fighters ( MRF ) for air defense, ground attack and reconnaissance using air-to-air, air-to-ground missiles and precision guided bombs. The original T-50 aircraft was designed as an advanced jet trainer following the LIFT concept. The KAI FA-50 light fighter aircraft was advertised as capable of attacking ground targets with Maverick air-to-ground missile, JDAM and other precision bombs, guided by Israeli-made Elta EL/M-2032 radar fire control system. The features, performance envelope and combat capabilities were cited to justify the high price tag of about US$ 38.66-Million per unit as contracted by the Department of National Defense for the Philippine Air Force. However, my research indicate an overprice of around US$ 8.66-Million per unit, when compared to the acquisition price of the same KAI FA-50 model acquired by the Republic of South Korea Air Force at US$ 30-Million per unit, with the Indonesian Air Force acquisition of the KAI TA-50 model optimized for attack role at US$ 25-Million per unit with provision for technology transfer. Lopez cited no references for his figures. Therefore it is not possible to ascertain the timeline for his valuation. The T-50 family of aircraft is a joint venture between Lockheed Martin and Korean Aerospace Industries that first flew in 2002. Since then, a number of version of the aircraft have been produced, culminating in the FA-50 received its Aircraft Worthiness Certificate in 2012 and entered thereafter. To validate Lopez's assertions, he must clarify when in the aircraft type's operating history were these figures taken. Otherwise, foreign exchange fluctuations -- not to mention inflation considerations -- cannot be factored into these figures. Consequently, it would be impossible to conduct a proper inquiry into his allegations of "overpricing". 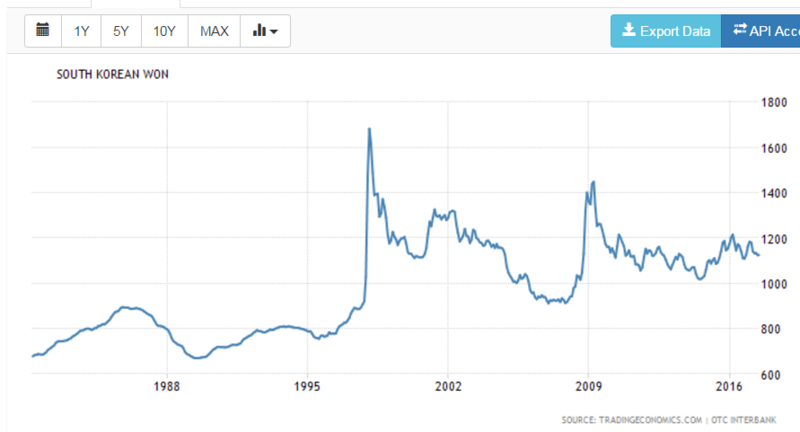 Note the volatility of the South Korean Won over the course of the T-50 family's life. It is also unclear which version of the T-50 family of aircraft Lopez was comparing his valuations against. Each aircraft have their own specifications . . . and therefore have their own -- still-undisclosed -- acquisition costs. Assuming Lopez really had basis for his values, to which aircraft were they for? As for Lopez's comparison with Indonesia. 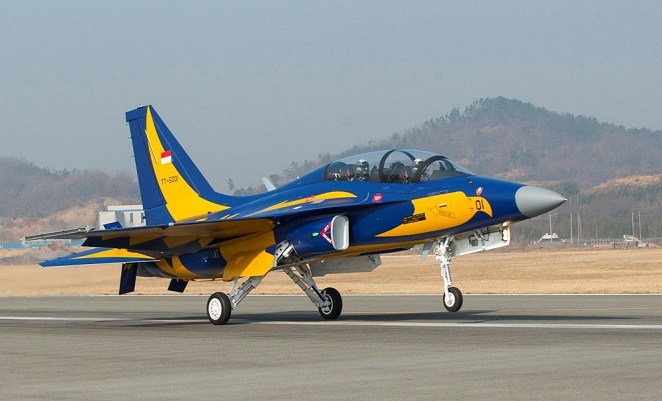 Unlike the PAF's FA-50 which have both a training and combat function, the Indonesian T-50i are primarly trainers, and were reportedly delivered in 2014 WITHOUT intercept radars. It would arguably be safe to assume that this will affect any attempt at an apples-to-apples comparison with the fully equipped Philippine aircraft. The PAF has officially acknowledged that FA-50s were used in combat for the first time in January 2017 against the Maute group in Butig, Lanao del Sur. 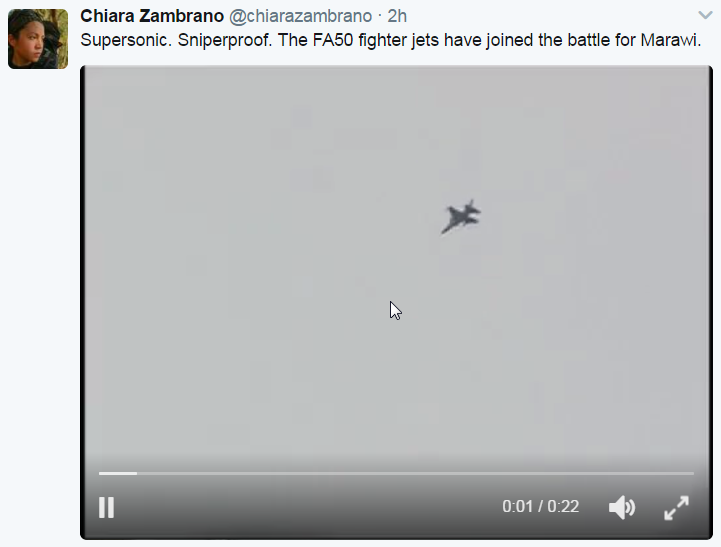 Chiara Zambrano also tweeted the following photo of an FA-50 over Marawi. "The unproven, high priced aircrafts was described by no less than President Rodrigo Roa Duterte as good only for ceremonial fly-bys." Another victim of Digong's cryptic talks. Clearly the Big D didn't say the FAs were total useless because it can't fire measles, for me what the Big D is saying the FAs were useless because the past admin bought it castrated and toothless as it is. In other words why buy these jets if you got no balls to buy measles along with it. Before the Marawi 'Crisis' (crisis lang daw sabi ng MMs) Digong was already prophesying to the troops about the upcoming war against Islamic extremist. Every time the Big D sees those naked FAs doing flybys he can't help but think how useless those will be when his prophesy will come true. “To the Air Force, do not misconstrue me. I’m a Filipino. I’m a citizen of this country and I have every right to say what I want to say. Sayang ang pera dun (Money was wasted there). You cannot use them for anti-insurgency, which is the problem at the moment. You can only use these for ceremonial fly-by,” -and this was in June 22, 2016. "sources from the PAF leaked serious technical issues of incompatibility/integration between the FA-50's radar fire control system with the U.S. Sidewinder air-to-air missiles, and perhaps with the Maverick ground attack missiles, JDAM and precision guided bombs it was suppose to carry for the required combat missions." Manny SD Lopez argumentum ad verecundiam is obvious the rest of his arguments can easily dismantled by well technically-informed individuals here. Pardon my simplistic opinion once again. Point is that, the PAF have these jets being part of their Flight Plan 2028 with these platforms serve as a primary training/interim fighter aircraft in line with planned MRF procurements in Horizon 2 (if all goes well). Simply speaking, the planners already have it set and they are aware as to what they are doing, contrary to the insufficiency of Mr. Lopez's points in his so-called arguments.